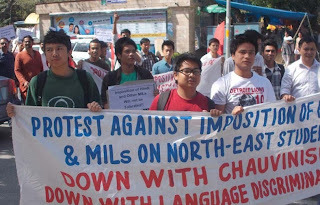 New Delhi, Apr 6 : Students from the northeastern states protested at the offices of the ministry of human resource development asking it to scuttle the introduction of Hindi or a Modern Indian Language in the compulsory foundation course in Delhi University's new four-year programme. They had been organized by the North-East Forum for International Solidarity (NEFIS). "We ... submitted a memorandum to the ministry demanding its immediate intervention to stop imposition of a compulsory Hindi language/Modern Indian Language (MIL) course by DU," says a statement from NEFIS. A group of five students also met the senior secretary of higher education. The students have been protesting since March 22 against what they regard as "cultural chauvinism" on DU's part." The list of languages - the syllabus will follow the eighth schedule of the constitution of India—does not feature a number of their own languages including Hmar, Tangkhul, Nagamese, Kuki, Bodo language, Sikkimese and Teniedie. They further argue that given the existing infrastructure, many languages included in the list, can't be taught. The North East Students’ Organisation (Neso) today petitioned Union HRD minister M.M. Pallam Raju on the decision of Delhi University to make Hindi a compulsory subject under major Indian languages. “We are sending this representation to your good office with regard to the decision of Delhi University to make Hindi a compulsory subject in major Indian languages, thus deviating from its earlier practice to offer the other major Indian languages including alternative English,” Neso chairman Samuel B. Jyrwa stated. He said the decision was “totally unacceptable” as it deprives indigenous students from the Northeast to study in the university. “The decision of the university, if not altered, and allowed to be implemented, can be construed as an act of discrimination towards the indigenous peoples of the northeastern region and also as an act of conspiracy to keep our students away from availing of the opportunity to study in this prestigious university,” he further stated. “We urge you to address this very sensitive issue and to give it all the seriousness it deserves,” Jyrwa added. 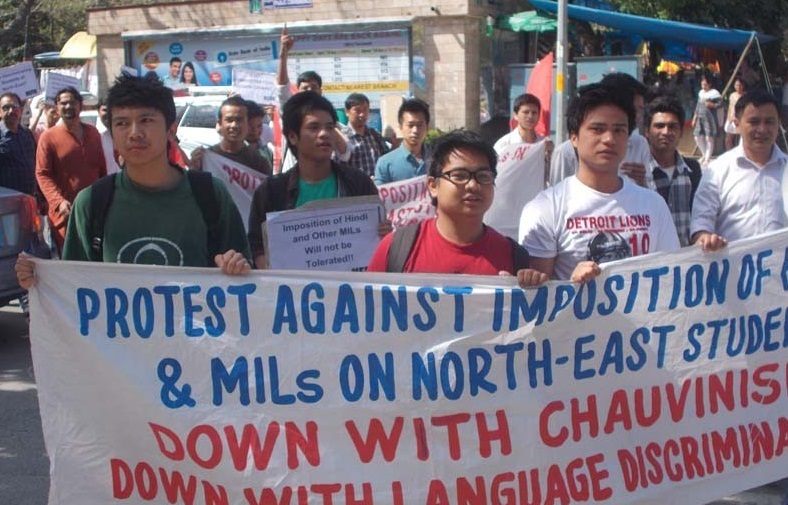 In New Delhi, students of Northeast Forum for International Solidarity demanded an immediate stop to such “imposition” of Hindi.